Market Forecast By: Cameras (Analog and IP), DVR/NVR, Encoders/Decoders, Software, Verticals (Government and Transportation, Banking & Financial, Retail, Industrial, Commercial and Residential), Regions (North India, South India, East India, West India and Central India). The rising infrastructure, government initiatives & funding, rules & regulations, increasing terrorist & criminal activities are the few factors that have spurred the market for video surveillance in India. According to 6Wresearch, India Video Surveillance market is expected to reach $952.94 million by 2016, with a CAGR of 32.49% from 2011-2016. 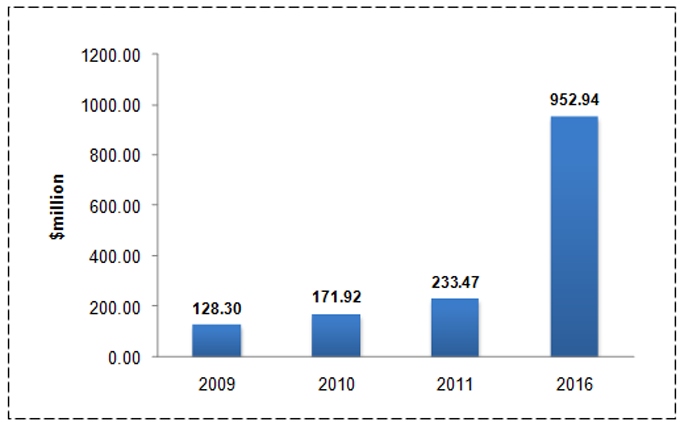 In 2011, though analog based surveillance systems have accounted for majority of the share i.e. 67.80% in the overall market, but IP based surveillance systems are expected to grow with relatively higher CAGR of 41.78% from 2011-2016. The report thoroughly covers the market by surveillance types, by unit shipments, by verticals and by regions. The report provides the unbiased and detailed analysis of the on-going trends, opportunities/high growth areas, market drivers which will help the stakeholders to device and align their market strategies according to the current and future market dynamics. • Analog based surveillance systems: Analog cameras, DVR and Software. • Verticals: Government & Transportation, Banking and Financial, retail, industrial, commercial and residential. • Regions: Northern India, Southern India, Eastern India, Western India and Central India. The Indian video surveillance market has evolved significantly over the past two decades, but has seen significant changes in its market dynamics especially after 2008 Mumbai terrorist attacks. Post 2008, the Government of India has taken several initiatives to install intelligent security systems such as video surveillance systems. The video surveillance systems are now getting deployed across industry verticals namely, government & transportation, banking & financial, retail, commercial, industrial and residential. The rising infrastructure, government initiatives & funding, rules & regulations, increasing terrorist &criminal activities are the few factors that have spurred the market for video surveillance in India. According to 6Wresearch, the India Video Surveillance market generated $233.47 million in 2011 and is expected to reach $952.94 million by 2016, with a CAGR of 32.49% from 2011-2016. Initially dominated by analog surveillance systems, the market is now evolving towards IP surveillance systems. IP surveillance systems accounted for 32.3% of the market share in 2011 and are expected to grow with a CAGR of 41.78% from 2011-2016. In 2011, in vertical markets, government & transportation accounted for the largest share i.e. 64.07% in the overall market and is expected to grow with a CAGR of 32.90% for the same period. On the other hand, in regional market Northern India contributes maximum towards market revenue.